Material: PET/PE, OPP/PE, OPP/CPP, OPP/METOPP, PET/METPET/PE, PET/ALU/PE, PET/ALU/PA/PP, PET/PAPER, PET/PAPER + HOTMELT etc. We offer Oil Printed Pouch lamination film with tight tolerances for specific end use applications with desired properties enabling them to find a value for their laminates particularly in respect of COF and Bonding strength simultaneously giving excellent seal property. We are a trustworthy organisation in offering a wide gamut of Printed Laminated Film. 1. Thickness:12 micron2. Max. width:1, 500mm3. General size:12 microns x1000mm x 1000m/roll; we can adjust according to your requirements.4. Colors and designs:plain color, hologram color, multi-color and other colors available or according to your requirements. Vivaan Flexi Pack Pvt. Ltd. is producing good quality of Laminate film for flexible packaging. The material includes high grade of raw material for better performance. Vivaan Flexi Pack Pvt. Ltd.
Lamination Film for laminating your precious things, Price negotiable. Multilayer Film, Shrink Film Milk Packaging Film, Milk Powder Packaging Film, Lamination Film, Liquid Packaging Film, Mulch Film, Oil and Food Packaging Film, Water Pouch Film, Liner of LD/HM and laminates as our future development. Visiting cards, Photo-books, Paper boards Text Books, Calendars , Posters, Luxury documents, etc. .
Release films to suit applications in the production of multilayers, flexible and rigid flexible circuits with standard press cycles (temperature upto 204°C) and higher temperature press cycles (up to 260°C). We make multi layer Printed/Laminated Food Packaging Films which are appreciated for their features such as moisture resistance, odourless oxygen burner properties.The characteristics of these films such as transparency, strength, flexibility and tear resistance make it ideal for use in various industries. 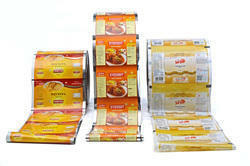 Our specially designed Packaging Lamination Films to ensure everlasting freshness of your product. 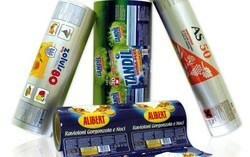 The packaging films provides perfect barriers against moisture. We offer reliable preservation of aroma and considerable extend in the shelf life of the food products.